Ledum Essential Oil is also believed to harmonize and balance the body's daily needs. It has cleansing properties. Ledum’s common names Labrador Tea or Marsh Tea takes it name from the fact that a tea was made from this plant. The pioneers of the west drank it to stay strong! It is in two professionally blended blends, Juva Cleanse and GLF. Want more information on Ledum Essential Oil? Keep reading below! It will tell you how to use it and what to use it for. It will also provide you with some fun suggestions, safety precautions for you and your animals! 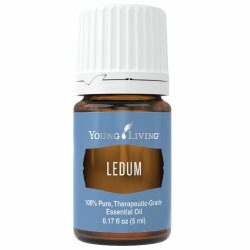 As I receive new tips for Ledum oil they will be added to the page, so check back frequently! Want to Purchase Therapeutic Ledum Essential Oil? Go to the Oil Shop! Buy Ledum Oil Here! Why is this information important? There are several species of Ledum and it has several common names including Labrador Tea, Marsh Tea or Swamp Tea. Ledum often includes Tanacetum palustre and Rhododendron tomentsum so it is definitely important to know your genus species and the common names for the oil you want to purchase. Where is the name derived from? Ledum comes from an Ancient Greek word "Ledon". What is the ORAC Value? I know that is has been measured, but I can't find it. If someone knows please let me know! The Quebec Study definitely did but I need access to the full study. What Does this Number Mean? ORAC stands for Oxygen Radical Absorbance Capacity. It tells you the antioxidant capacity of a food item. This was developed by the USDA researchers. For instance: Oranges = 750; Clove = 1,078,700. Wow! The number for clove is NOT a typo! Did you know that Ledum was catalogued by the New World European Botanists? Yes, it was one of the first ones to be catalogued! What are the Plant Properties? Harmonizing and Balancing. What are the Documented Uses and Benefits of Ledum Oil? Cleansing. What is the Aromatic Affect on the Mind? Its herbaceous aroma is clearing and grounding. What is the Spiritual Influence? Ledum release the emotions of dissatisfaction, anger and obsession. It will help us let go of negative memories and experiences that may be the root of those negative emotions. Once we release negative emotions, this oil can help us stay spiritually centered and stay in the moment. What Chakra is Affected? Solar plexus chakra. Can this Oil be used for Animals? Yes Have your animals smell it directly from the bottle or place a drop or two in your palm, then smell. Or place a drop in your palm and pet head to toe. Note about Animal Use: Certain oils can be very toxic to cats. Pine and citrus products and oils in particular that are not of therapeutic grade! Please consult your vet if you are not sure about applying any essential oil to your pet. I only recommend using Young Living Oils on animals at this time. What are the Safety Precautions? Only therapeutic grade essential oils should be used for best results. Dilution recommended only for skin that is very sensitive; or in sensitive areas. Did you know that the Cree Indians called this plant muskekopukwan?